Peter Tesar Architectural Design - Curves, curves, curves! Create that curved ceiling. Want to create the perfect curved ceiling for that authentic period cottage look? Well, there is the easy way or there are two hard ways…. Your choice! Straight lines and contemporary finishes seem to be the norm these days, however here in Hampshire we have period properties peppered around our landscape. And not all want the ‘new ’ look and the old trades are becoming fewer as they hang their tools up for a well earned retirement. This leaves the new up & coming trades people to cope with the older properties that they may not have any experience with? I am not saying that they are all bad, I am merely noting the fact that they have probably cut their teeth in on the new properties that are being thrown up within our green belt areas ( that ’s another subject for another issue! ). 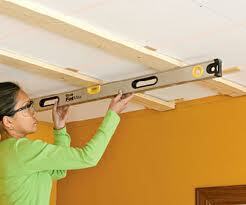 Fit conventional ceiling joists to normal building regulatory standards, i.e structurally sound and straight! Plasterboard the ceiling as you would if it was to be a level ceiling design. Then in patches ( sizes to suit the contour of choice ) over lay a second layer of plaster board, at this stage it will look very odd but once your plasterer has bonded & softened these edges into the first layer, the shape starts to form and once it has had a final skim plaster finish, it will look as authentic as an aged period property!